Having recently covered ExxonMobil it would be remiss of me to leave out fellow North American major Chevron (NYSE: CVX). Back in the dark days of 2015/16 the latter had arguably the worst outlook of the big oil companies depending on how you view things. 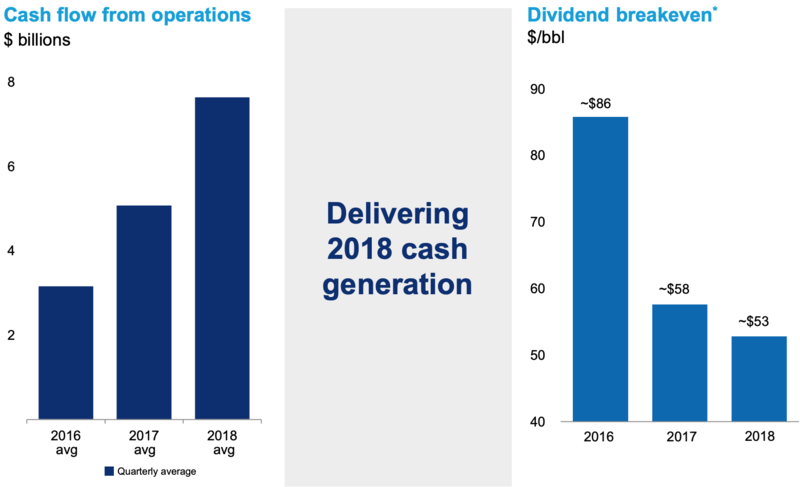 For instance, the relative difference between cash generated by Chevron’s business operations and cash spent on dividends and capital expenditures topped all of the other oil-majors in 2015. (The company’s net cash burn figure topped $17 billion that year). Taken in isolation that situation doesn’t sound particularly healthy. The reality though is that this is pretty much exactly how oil & gas companies should operate. In times of favorable (or even modest) commodity prices they make more money than they know what to do with. When the downturns arrive they ought to be in decent condition to ride them out. For example back in 2012 the price of Brent Crude oil averaged $110 per barrel over the course of the year. Chevron ended that financial year with over $20 billion in cash on its balance sheet versus total debt of approximately $12 billion. The tough part for energy investors is remaining calm during the subsequent down years. Take the great oil price crash of 2014-2016 as a good guide. It totally flipped Chevron’s balance sheet on its head. By the end of 2016 the company sported a net debt position of just over $39 billion. How many folks at the time thought that totally unsustainable? Many. In reality this was entirely normal behavior for a cyclical company. 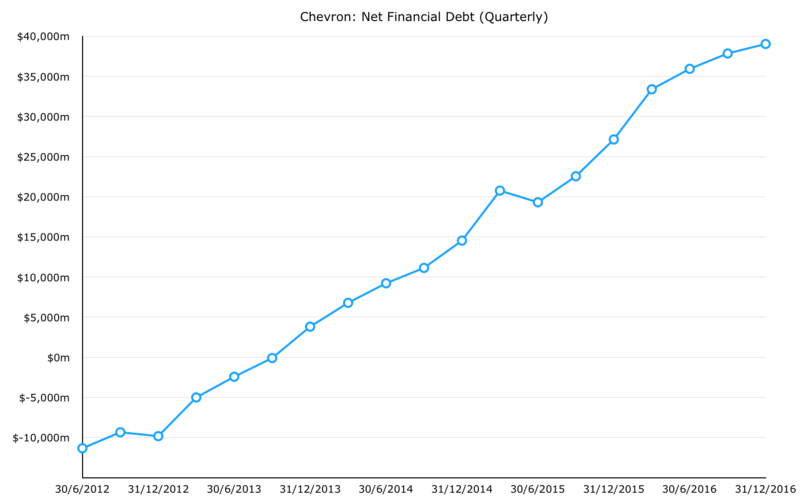 After all Chevron didn’t exactly blow all of that cash it raised via debt issuance. It now has around one billion barrels more in reserves than it did at the end of 2014 and it produces around half a million barrels per day more. The key takeaway: leveraging up during cycle lows is fine. The trick is to rake in the cash during the good times. Here is where it gets exciting for all the Chevron shareholders out there. This year cash capital expenditure will clock in at around $13.5 billion (roughly similar to last year’s spend). At current Brent crude oil pricing (roughly $70 per barrel) Chevron generates around $30 billion in cash from its day-to-day operating activities. Subtracting a one billion dollar per quarter stock buyback program, plus its dividend commitments, still leaves several billion dollars in surplus cash for 2019. The upshot: with oil prices in the $60s-to-$70s per barrel Chevron is once again printing cash and shoring up its balance sheet. Right now I’m minded to prioritize that over stock buybacks for two reasons. Firstly, I like conservative balance sheets. It’s worth remembering that Chevron paid $750 million last year in interest payments on its debt. By my count that is equivalent to taking off around seventy cents for every barrel equivalent of oil & gas the company produced that year. More importantly, and as I mentioned above, cyclical companies make hay while the sun shines. When the next downturn pops up Chevron can deploy a stronger balance sheet to pick up cheap reserves or buy back stock at lower share prices.